Are you a blogger or an influencer? Do you work in the wine, food or restaurant trade? Then you absolutely must not miss the Cibiamoci Festival! After attending some events with a lot of wine tastings, such as ProWein or Vinitaly, it’s time to talk about training in the digital and marketing world. Wine has a sensational history! Most people who work in this field prefer the traditional methods of communication. But it’s time to upgrade your marketing strategies for the new generation, the Millenials and Generation Z. Now I want to explain to you what Cibiamoci Festival is. On 16th of May 2017, the Cibiamoci Festival will take place in Pistoia, Italian Capital of Culture 2017. This will be the 2nd edition of the event! I’ve been chosen as wine ambassador for this event. I’m very happy! 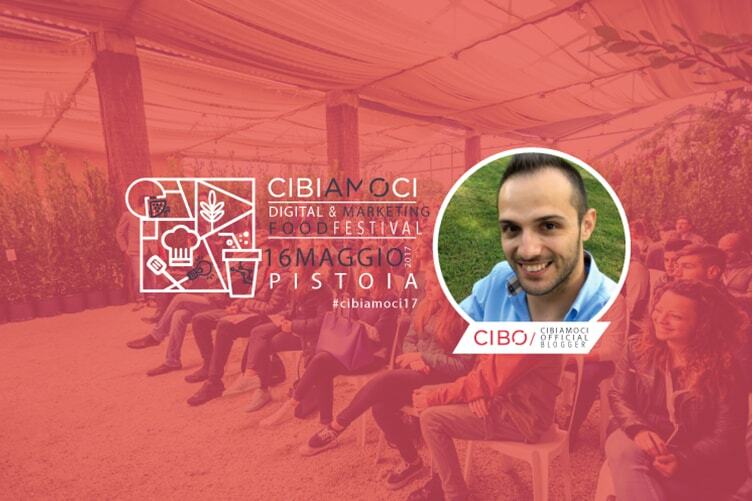 I will be one of the four CIBO-bloggers together with Elena Mazzali, Monia Taglienti and Valentina Spinetti. I will be the one to let you know all about this event. I suggest that you also check my Instagram Stories and Snapchat before, during and after the event! Ok, why should you take part in it? I’ve already mentioned that digital communication is very important nowadays. There will be different speeches about wine, food and the restaurant industry during the festival. I suggest you take a look at the official program! The speakers will give you some tips and tricks to increase your business online. Another important thing is that you could meet all the people, including myself, who have two great passions: wine and food! It will be a very nice get together with good wine and some delicious food. If you want to take a look at my Italian interview, you can see the official website of the Cibiamoci Festival. Otherwise, you can read the English version below. We drink sips of web in Cibiamoci, but we’re also wine lovers. How has the digital world affected the culture of the wine lover? The digital side of our lives is becoming hard not to notice and it allows everyone to have their own passions closer to them. Wine is still a very traditional field. But it is adapting to this changes and innovations. Until very recently, if you wanted to gain even a very basic knowledge about wine, your only options were to take part in classes led by a sommelier or to get to know some wine experts. Nowadays, it’s much easier and more accessible! Do you want to know what wine you are drinking? Just reach for your smartphone and take a picture of the label and there’s sure to be an app that will give you all the information you need in a matter of seconds. Or maybe you want to know how many colours a wine can be produced in (in addition to the classic white, red or rosé)? Just use a search engine and you can find a lot of results straight away. But beware! There might be very cool, fast and easy ways to obtain information but, as with anything else, you could also end up with wrong or contradictory information. Personally, I’ve found some blogs that contain mistakes or basically incomplete articles. It’s very important to follow some recognized industry experts, especially for the more complex topics. For the more avid wine lovers there are also sommelier courses, that are efficient and specific. In the last years many small wineries have started to sell via different e-commerce platforms. Is this a temporary trend or a real opportunity for them? These new e-commerce platforms are doing the same job as commercials and other forms of advertising have done until today. A big plus compared to the commercials in the past is the online visibility which means that a much greater number of people can be reached through them. I don’t think that this change is just a trend but believe that it’s necessary for the digitization of the wine industry. It’s very good that wineries invest in these e-commerce platforms and also in social networks. What does a wine lover taste in a glass of wine that’s over and above than just the flavour? Every glass of wine is different from the other and there are many reasons for it. Wine can generate emotions! I think that opening a bottle of wine and drinking it with friends is one of the most beautiful pleasures in life. That bottle can represent happiness, routine or failure. But there is something that I would like to underline: you might only take a few minutes to drink a wine bottle, however a winemaker may take years to make it. It’s very important to respect all those wine producers who make it possible for us to share our best moments together with our friends and loved ones accompanied by a bottle of good wine. If you liked my interview, I invite you to click on +1! For you it costs nothing, but for me is very important! Now that you know all the information about the Cibiamoci Festival I hope to see you take part in the event. For this reason I have a gift for you! A special discount code that you can insert during the registration. You can contact me via email to obtain it! If you need more information about the festival, you can write me a comment.